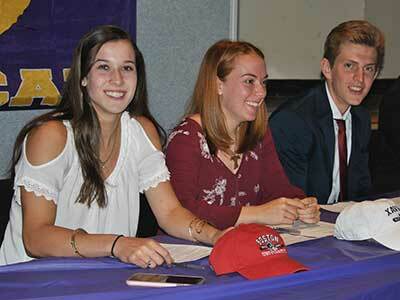 Congratulations to student athletes (L-R) Greer Liguori, Jennie Prial, and Sean Quinn. 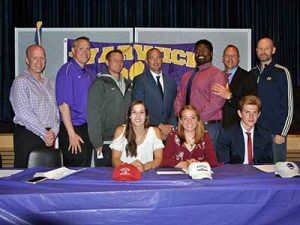 Three WVCSD student athletes signed National Letters of Intent to compete for their college of choice in the fall. Jennie Prial, a three season standout (cross country, indoor and outdoor track) signed to attend Xavier University of Cincinnati, OH, and compete as a track athlete for the Musketeers. Jennie was recruited by Ryan Orner (Warwick alumni), track coach at Xavier University. Xavier competes in the Big East Conference for track and field. 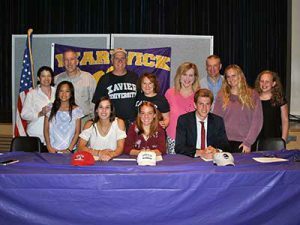 Jennie will join Warwick alumni Grant Parrelli and Aaron Peterson who compete for Xavier. She chose Xavier over Johns Hopkins, Villanova and Quinnipiac, and she plans to study Nursing. Jennie’s family includes proud parents Gregory and Anne Prial, and siblings Terence, Danny, Becky and Brigid. 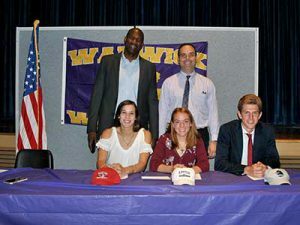 Greer Liguori, a three-season standout (soccer, basketball, track and field), signed to attend Boston University, Boston, MA, and compete for the Terriers in track and field. Greer was recruited by Greg Lambert, assistant track coach at Boston University. 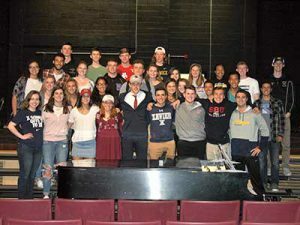 Boston competes in the Patriot League for track and field. Greer chose Boston University over University of Connecticut, Manhattan and Delaware, and she plans to study physical therapy. Greer’s family includes proud parents Therese and Paul Liguori, and siblings Donovan Rock, Matt, Dylan, Evan, and Jade. Sean Quinn, a three season standout (cross country, indoor and outdoor track), signed to attend Monmouth University in West Long Branch, NJ, and compete for the Hawks in indoor and outdoor track. Sean was recruited by Chris Tarello, assistant track and field coach at Monmouth University. Monmouth competes in the MAAC Conference for track and field. Sean chose Monmouth over URI, Sacred Heart and Marist, and he plans to study biology. NYSPHSAA Scholar – Athlete 4 years. Sean’s family includes proud parents David and Adrienne Quinn, and siblings Kathryn and Grayson.